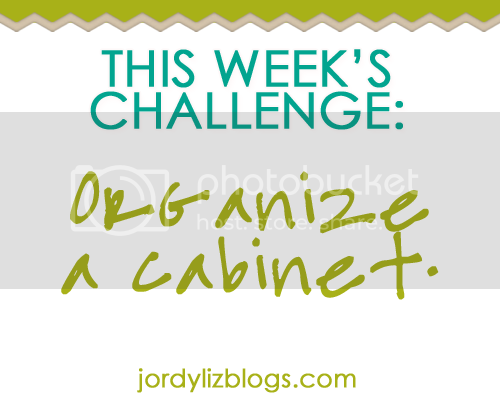 Jordy Liz Blogs: Organizing Life: A cabinet. There are several cabinets in our house I could have chosen for this challenge, but I wanted to pick a cabinet I use every day. Therefore, my bathroom cabinet became the project. Not only do I use it every day, but every day bottles fall out and I can barely shut it. It was time for a quick overhaul. And yes, you get a peek inside my bathroom cabinet to learn all of my well-kept secrets. I threw several items out, put a few items in a different cabinet with their counterparts, and then only kept the items in the cabinet that I use daily. It's already made a difference in my quick morning and evening routines. And guess who jumped in on the challenge this week? This means double organization will be going on in this house if my husband keeps it up. If it's improvement, then that is good! I am not a big "product" person, so the cabinet is always a little bare. I'd love to see your space! Your "before" picture looks like what I think my "after" picture would look like if I tried a bathroom cabinet! Double organization is always nice also.